Ryan and Travis installed a refrigerator and slide in stove in my house. Their work was excellent and both are extremely conscientious. I definitely recommend Pro Line Appliance and will continue to be a customer. Bravo- job well done! Hi Ann, thank you for leaving a review. We're always happy to hear that our customers are pleased with the technical portion of the service we provide as well as the courtesy and respect we expect our teams to exhibit while they're representing the company. Ryan and Travis are real artists when it comes to combining their customer service skills with their aptitude for repairing and installing appliances. Thank you for choosing Pro Line Appliance Installation! Personnel and service were outstanding. Both Brian and Angelica provided service in late December that permitted us to enjoy the holidays with our company. I cannot recommend the firm and personnel highly enough. Hello Mr. Rapp, thank you very much for taking the time out of your busy holiday season to let us know how our employees are performing. Brian and Angelica are both wonderful people and equally valuable employees. Thank you for allowing us to be a part of making your holiday plans a success. Moving forward, If we can help in any way please let us know and feel free to ask for Angelica or Brian by name. Have a safe and happy new year from everyone at Pro Line Appliance! Hello Charles & Carolyn, thank you fo taking the time to leave such a detailed account of your experience with two of our technicians. 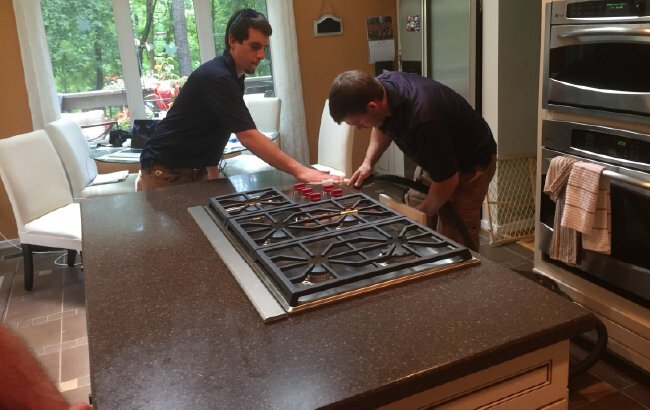 I couldn't agree with you more, Joe & Matt are both extremely knowledgeable and equally caring & cautious everytime they're installing appliances in any of our customers' homes. I can assure you that the value of all of our employees never goes unnoticed. Please feel free to shoot us an email or give us a call if you have any questions regarding your recent installation. Happy Holidays from everyone at Pro Line Appliance! We have used Pro Line Appliance several times for installations of appliances in homes where remodeling is taking place. We are especially pleased with their services. Hello, Inspired Interiors! Thank you for the kind words and know that we're already looking forward to the next time we're able to work with you. I purchased a used Viking 2 years ago that suddenly had a blank display panel and wasn't working. I don't know anything about fancy fridges and certainly had no idea that only certified technicians can work on Vikings so I was pretty concerned about how long it would take to get service when I found out from the 1-800 number that there were only two certified companies in my area. I called Pro Line Appliance, and they sent out a technician the same day when they found out my fridge was completely out and I had no other way to refrigerate food. Unfortunately, the needed part is discontinued. Thanks to Brian from Pro Line Appliance who did a lot of research in a short period of time, we found out the bad news sooner rather than later so we could make an informed decision sooner rather than later. Bad appliance news is never an easy pill to swallow, but excellent customer service makes it a little better. Hi Kim, thank you so much for sharing your experience. Your story involving an appliance we were unable to repair is not a story we usually get a chance to share publicly with the people visiting our website. In the rare cases when parts specific to a repair are discontinued it can be a hard pill for our techs to swallow too. Your appreciation of our commitment to customer service is greatly appreciated and we hope that if you require installation or service for an appliance in the future you will call us again. Best of luck! Joe visited our office today and installed a new beverage center. He was professional and super easy going! I would highly recommend using Pro Line Appliance. Hi Tabitha, thank you for sharing your experience with us. Joe is a great guy and an extremely knowledgeable appliance installer. I hope everyone in your office enjoys their new beverage center. Let us know if we can help you with anything else in the future. Thank you, Mary & Jack! Our installers love to share as many tips and best practices as possible. When our Customers are happy we're happy. Had replacement kitchen appliances (stove top, double ovens, refrigerator, dishwasher and trash compactor) installed by Joe and Matt. Very professional job and they were great to work with. Would certainly use and recommend Pro Line Appliance. Hi WarnerB, wow! That's great that you were able to schedule so much installation work at the same time. It sounds like your kitchen received an appliance makeover. Please let us know if there's anything else we can help you with we'd love to work with you again. Washer and dryer installation - efficient and professional. Would recommend to friends and hire again. Hi Ryan, thank you. We would love to work with you again, and we'd be more than happy to speak with any of your friends about the appliance services we offer.